Janmashtami, the birth of Lord Krishna is celebrated with great devotion in the August/September months, on the Ashtami of Krishna Paksh or the 8th day of the dark fortnight in the month of Bhadon, in the whole of north India. Temples and homes are beautifully decorated and lit. An attractive feature of the celebrations are cribs & other decorations depicting stories of Lord Krishna’s childhood. There are five main “jhankis” of Janmashtami which depict the entire sequence of events from Lord Krishna’s birth to his being discovered in Gokul. The “jhankis” include the birth of Krishna in jail, Vasudev carrying Krishna to safety across the river Yamuna amidst thunder and lightning, Vasudev’s return to the jail, Kansa killing Yashoda’s daughter and finally the little Krishna in the cradle in Gokul. “Jhankis” are created out of dolls dressed up as kids, men and women with lehangas, chunnis, dhotis & kurtas. Raslila of every type are also performed – Janmlila, Shankarlila, Putnalila and Naglila. 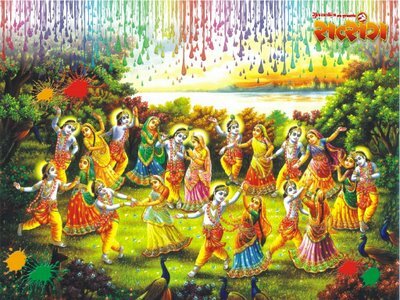 In the evening bhajans are sung which end at midnight, the auspicious moment when Lord Krishna was born. Thereafter arti is done, prasad distributed and flowers showered on the idol. Mathura, the birthplace of Lord Krishna, where his parents lived in captivity of the evil Kansa and he as a young boy came and vanquished his maternal uncle Kansa to ascend the throne and free his parents, celebrates Janmashtami with great enthusiasm. The main celebrations are performed at the Dwarkadhish temple, Mathura in the form of Jhulanotsava and the Ghatas during the entire month of Shravan. The ghatas are a unique feature of the month long celebrations. During the ghatas of a particular colour the whole temple is covered with decoration in the same colour. Even the Lord dresses up in the same colour. The twin cities of Mathura-Vrindavan takes on a festive look and spirit of devotion runs high among the people. It was on the banks of the Yamuna river where Lord Krishna played during his childhood and indulged in pranks and tricks with his friends and the gopies. There are about 400 temples dedicated to Lord Krishna in this sacred city and the major festivities are held at the Banke Bihari, Rangaji, Shri Krishna Balram temple and Gopinath temple. The Raslila of Braj is thematically the basis of many performing arts. Lord Krishna was born in the DuaparYug which came just before the Kal Yug and Janamasthami, his birthday falls on the Ashtami Paksh or the 8th day of the new moon fortnight in the month of Bhadra some time in July or August. The Jhankis ( tableaux) depicting many significant scenes from Lord Krishna’s life are the intrinsic part of Janmasthami. Devotees also make beautiful Jhulans (Cradles) for the baby Krishna. In some parts of India, young men break the Matkas (Earthen Pots) filled with butter and curds. The most important tableux is that of baby Krishna. A idol of baby Krishna is placed on a cradle, which is rocked to recreate scenes from Krishna’s infancy. The devotees believe that anyone who makes a wish and while rocking the cradle in which the Lord is, his or her wish will be granted on this day. Other popular Jhankis are Kaaliya Mardan(vanquishing the black snake Kali Nag), Kansha vadha ( Killing Kansha) and lifting the Govardhan Parbhat. In Brindavan, every year the Raasleelas or the folk theatre acting out Krishnas Lifes stories begin much before the Janmasthami day. These Raasleelas are staged by professional drama troupes or even young children. These dramas characterised by colourful costumes and equally colourful backgrounds. Raasleelas are usually accompanied by musicians and are very popular among the people. The language spoken by the actors and the actresses is the Brajbhasha but sometimes Hindi is also used. The ceremony of worship is a very simple affair. The priests chant holy mantras and bathe the idol with Gangajal (water from the holy Ganges river), milk, ghee (clarified butter), oil, and honey pouring all these from a conch shell. Only after the ceremony is over, the devotees break their daylong fast . In Janmashtami, the devotees keep awake and sing bhajans till midnight, the moment when Krishna was born. People fast all day and eat only after the midnight birth ceremony. Often the image of the baby Krishna is placed on a swing and bathed with charanamrit (holy water). Midnight prayers are performed. The sound of hymns and religious songs extol the greatness of Krishna. This festival occurs on the eight day (Astami) of a lunar fortnight hence the name (Krishna+astami). 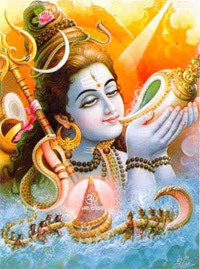 Krishnastami which comes sometime in August is celebrated over two days. The first day is Krishnastami or Gokulastami. The second day is called Kalastami or more popularly Janmastami. 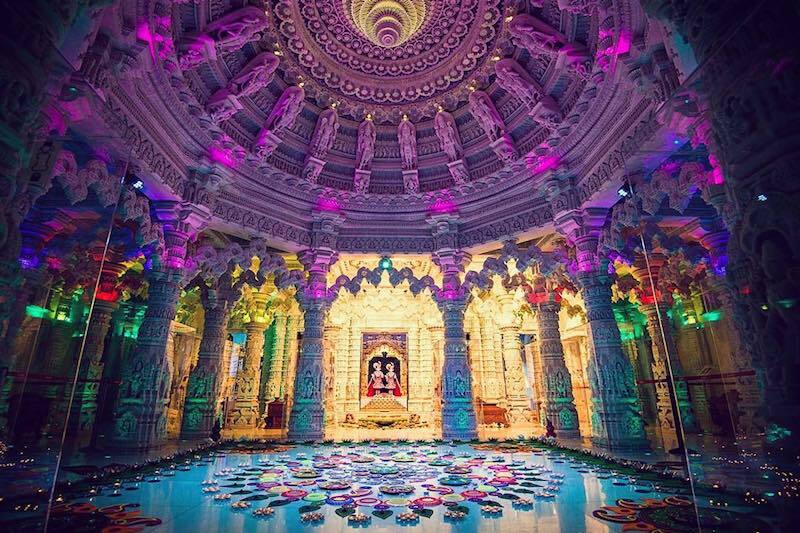 At midnight between the first and second days the ‘birth of Lord Krishna is replicated with pomp and ceremony. Delicacies are prepared from milk and curds that Krishna loved. The more popular ceremony of Dahi-handi (breaking a pot full of milk and its derivatives} takes place on the second day. This ceremony is so popular that Krishnastami has come to be synonymous with the ceremony of Dahi-handi. During this ceremony a large earthenware pot is filled with milk, curds, butter, honey fruits etc. and is suspended from a height between 20 to 40 feet. Sporting young men and boys come forward to claim this prize. To do so they construct a human pyramid by standing over each other’s shoulders till the pyramid is tall enough to enable the topmost person to reach the pot and claim the contents after breaking it. Normally, currency notes are tied to the rope by which the pot is suspended. This prize money is distributed among those who participate in the pyramid building. In his childhood, Lord Krishna along with his mates used to raid the houses of his neighbours in search of milk and butter. It is a common practice in India to tie up food articles in a pot suspended from the beams of the roof so as to prevent domestic animals like cats and dogs from despoiling them. We are told that every day after the men and womenfolk left for their farms, the naughty and adventurous Krishna along with a band of his mates would build a human pyramid and plunder the caskets of milk and butter much to the chagrin of the owners. Krishna Lila The story of Lord Krishna reflects life in a pastoral society. Cattle are the principal means of subsistence. The activity of people revolves around tending cows, milking them, making curds, butter etc. Krishna himself has names displaying a pastoral charecter. Govinda and Gopala as he is also known, mean cowherd. In Sanskrit ‘go’ means cow. Krishna is always shown with his flute (Bansuri). He is considered to be the Hindu God of Music and is the patron god of Indian musicians of the traditional schools (Gharanas), irrespective of their religion. ould tolerate no more of it and in a dream Kansa was told that his evil reign would be brought to an end by his sister Devaki’s son who would kill him. The cowardly tyrant immediately threw his sister Devaki and her husband Vasudev in prison so that he could kill all the sons born to Devaki. In captivity Devaki bore six sons, each of whom were promply killed by Kansa. The seventh time, the gods again thought it necessary to intervene. On the night of the birth of their seventh child, the prison guards fell into a deep slumber and the doors were unlocked. Taking advantage of this opportunity, Vasudev slipped out of the prison and whisked away the God-child to the safety of a neighbouring kingdom which was ruled by king Nanda. King Nanda’s domain lay across the Yamuna river. We are told that at that time the Yamuna was in spate, but when the waters touched the feet of the God-Child Sri-Krishna, the waters parted making a channel for Vasudev to pass. The generous king Nanda gave away his new born daughter to Vasudev knowing fully well what fate awaited her at Kansa’s hands. Next morning Kansa completed his gruesome job complacent of the fact that his would-be avenger was still living. At Gokul, under king Nanda’s protection, Krishna got the loving affection of Nanda’s Queen Yashoda whom Krishna looked upon as a mother. Days passed in fun and frolic, while the child-Krishna grew up. But one day rumours reached Kansa that Devaki’s son had somehow escaped his cluthes and was living in Gokul. Krishna continued to grow at Gokul. He acquired notoriety as a pilferer of milk and butter, but had endeared himself to the people of Gokul by his playfulness. Among other things, he is said to have done at Gokul, he lifted Mount Govardhan to save the people of Gokul from a storm. He also tamed Kalia, a giant snake that lived in the Yamuna river and terrorised the people of Gokul. While still in his teens, Krishna came to Mathura where King Kansa had organised a wrestling tournament. Krishna participated in it and after defeating all the contestants, he challenged Kansa to a wrestling bout. The evil Kansa’s time was up: Krishna defeated him and killed him. The people of Mathura were relieved. Another major event in Krishna’s later life was that he functioned as an adviser to the Pandavas and during the Mahabharata war between the Pandavas and Kauravas he was Arjuna’s (one of the five Pandava brothers) charioteer. The original recitation of the Bhagvad Geeta (Song of the Blessed Lord) is accredited to him. This document contains profound ideas on many issues touching on the temporal and non-temporal aspects of life.